*NEW for spring 2019: Renovations coming - check back for updates! As birds coo in the trees and frogs croak beside the babbling water, turn the hamburgers over on the charcoal grill and take another sip of your ice-cold drink. It’s just another picturesque day by the river while staying in your charming Smoky Mountain stone cottage, River Romance! After savoring every sip of your coffee from your lawn chair mere feet from the peaceful running waters of the Pigeon River, take a short walk to the downtown shops of Gatlinburg, Tennessee. 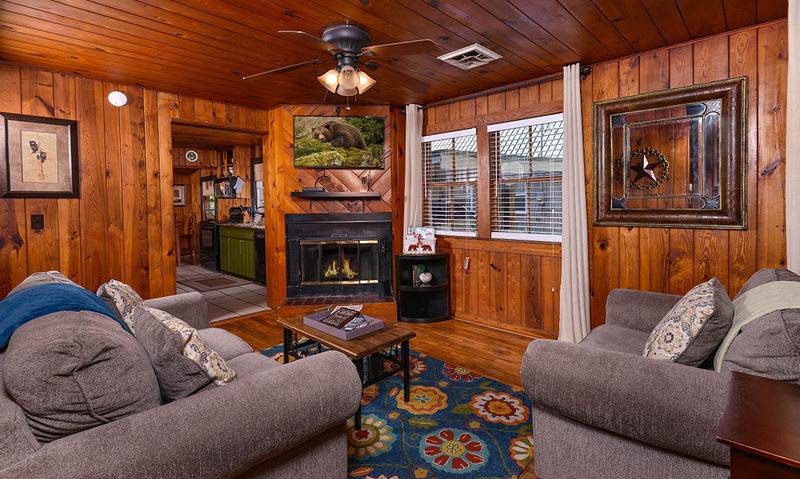 Days of exploring the Gatlinburg Arts and Crafts Community, Ripley’s Aquarium of the Smokies, and Fannie Farkle’s are complemented by evenings around the fire pit, movies on the large flatscreen TV, and restful nights’ sleep in the 2 cozy bedrooms. With 2 bedrooms, 2 bathrooms, and homey furnishings, River Romance is a pleasant river cottage perfect for your small family escape to the Smoky Mountains or a couple’s Gatlinburg getaway - and it's pet friendly! Take advantage of the crisp morning mountain air and take scenic hikes through the nearby Great Smoky Mountains National Park with the kids. Walk outside to the inviting outdoor seating area and fish with your kids just steps away from your cottage’s back door! Or tour the Rocky Top Wine Trail while on vacation with another couple as you toast to some time away from kids and work. At the end of the day, quietly relax in a bath in the indoor jetted tub or soak in the new hot tub before getting ready for an anniversary dinner in Gatlinburg with your spouse during your romantic getaway. Whatever brings you to the Smoky Mountains, enjoy the beauty of nature and the excitement of Gatlinburg while staying in River Romance! 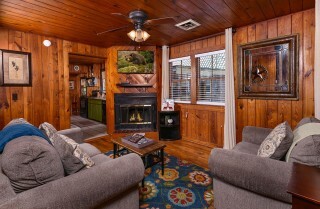 Lounge in the tranquility of the mountain cabin atmosphere in the living room surrounded by warm wood and natural lighting flowing in from the windows. The cushy heather-gray couch is an inviting napping space in the afternoon glow passing through the blinds. Far away from the stresses and business of everyday life, get back to your current reading obsession in the cozy reading chair under the light of the lamp in the evenings. After starting a fire in the wood-burning fireplace, situate the kids with pillows and blankets on the couch for special movie night on the large flatscreen TV mounted above the mantel. 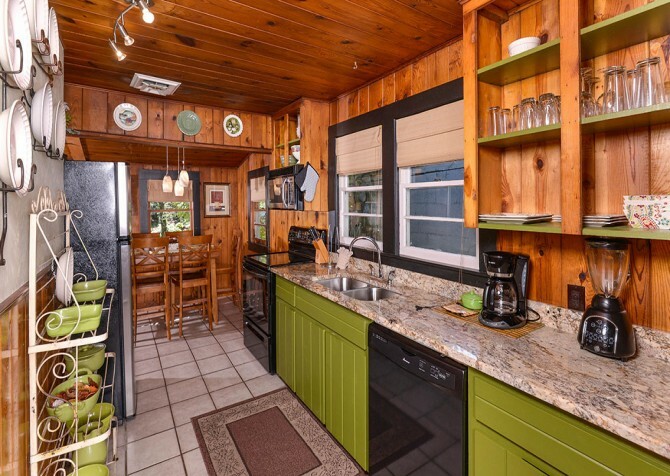 In the mornings, sip on your coffee while watching your favorite morning TV shows before heading downtown to explore the local shops. The quaint country kitchen with wood walls, whimsical green cabinets, and granite countertops provides a homey space to prepare delicious cabin-made meals with the help of all the conveniently provided cookware, tools, and plates! Store leftovers from all your savory meals of generous portions in the full-size refrigerator to reheat in the microwave or oven for a quick snack in between excursions. 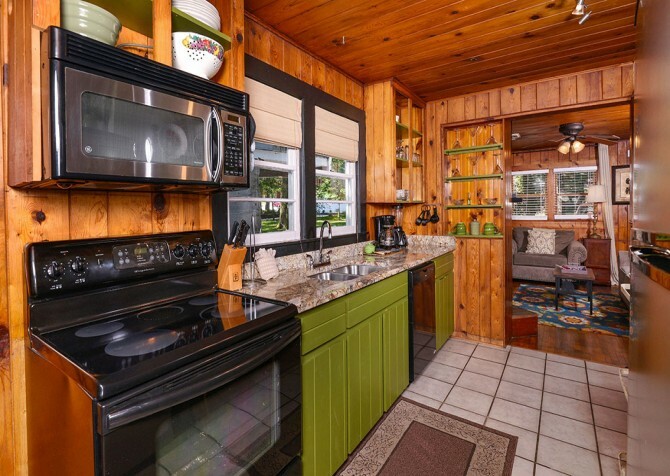 Fresh cups of coffee from the coffeemaker in the morning help wake you up and get you going to make the most of every day while staying in the Smokies. 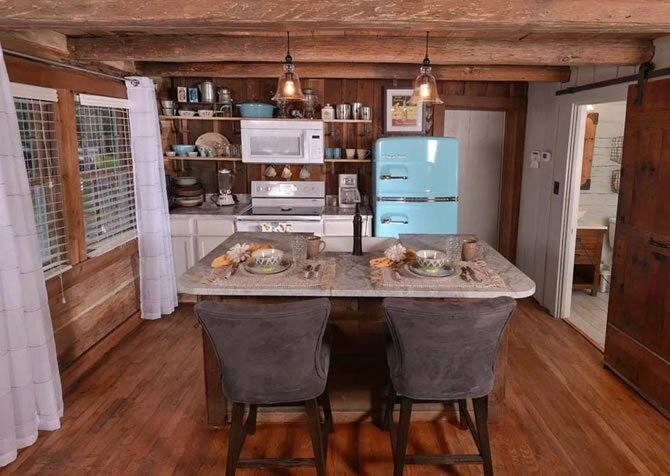 The touches of farmhouse décor and soft light drifting in through the kitchen windows lend the feeling of simpler times in between new, exciting experiences in Pigeon Forge and Gatlinburg. After a full day of exploring downtown Gatlinburg and eating out for breakfast and lunch, come home to your cottage to save some money on a delicious cabin-made meal around the wood high-top dining set. Set the table under the marble pendant lighting with the charming paisley dining set from the kitchen cupboard. Laugh and reminisce over the kids’ favorite moments during the family’s Penguin Encounter at Ripley’s Aquarium of the Smokies. 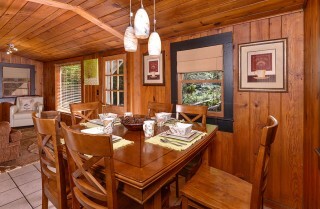 In the beautiful natural lighting pouring in through the windows, let river views soothe your mind as you sip on your morning coffee at the table. 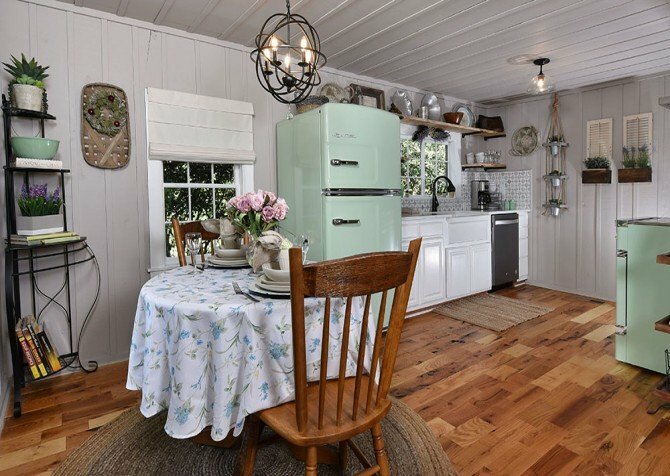 During downtime in the cottage, clear the table and play your favorite board games from home or card games with the commemorative playing cards you picked up at the Old Mill General Store. It will be a great space to gather and enjoy time with family and friends – with river views! A room dedicated to peaceful relaxation, the sunroom/sitting area in River Romance. The oversized cushy couch is the perfect spot to hole-up for an afternoon nap. 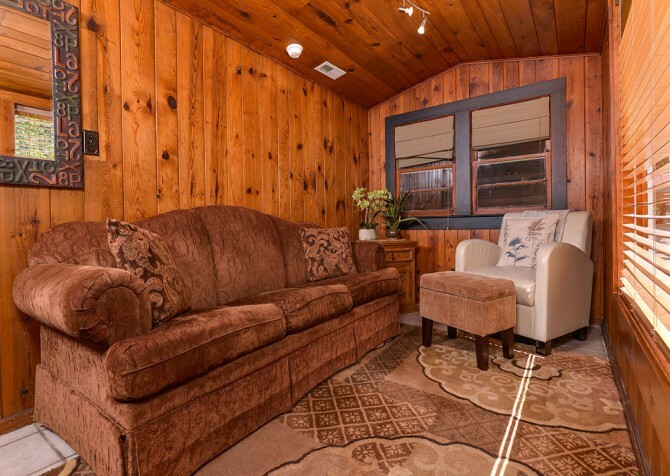 With the faint light peeking through the blinds, let your eyelids grow heavy as you recline on the brown suede cushions after an adventurous hike to Andrews Bald. 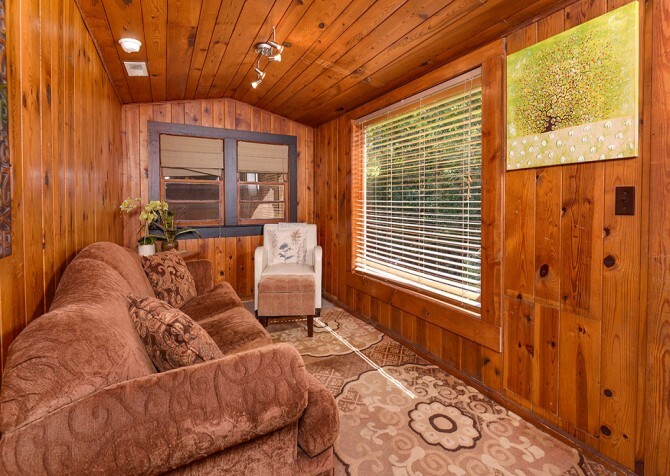 Draw the blinds and let the light pour in and the full view of the river soothe you before sitting in the reading chair for some alone time with your favorite magazine. Sip on a delicious cup of Spiced Orchard Oolong tea from the Gatlinburg Spice and Tea Exchange as you and your partner hold hands and enjoy the early morning light reflecting off the river waters through the window. The soft glow of morning through the translucent white curtains is a dreamy atmosphere greeting you as you awake from your restful night’s sleep in the king-size bed of the master bedroom. 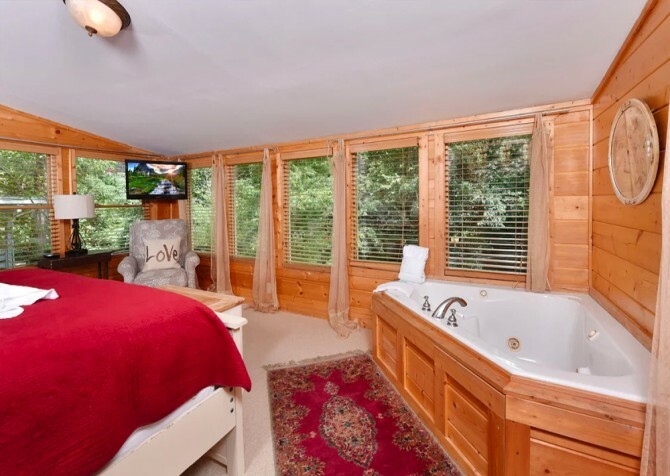 You can flip on the flatscreen TV mounted in the corner for late-night shows after showering off in the en-suite bathroom. Bedside tables with lamps are perfect for bedtime reading and keeping phones and glasses easily available. 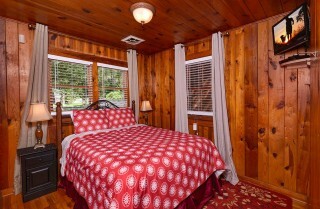 In the adjacent bedroom, a queen-size bed awaits. 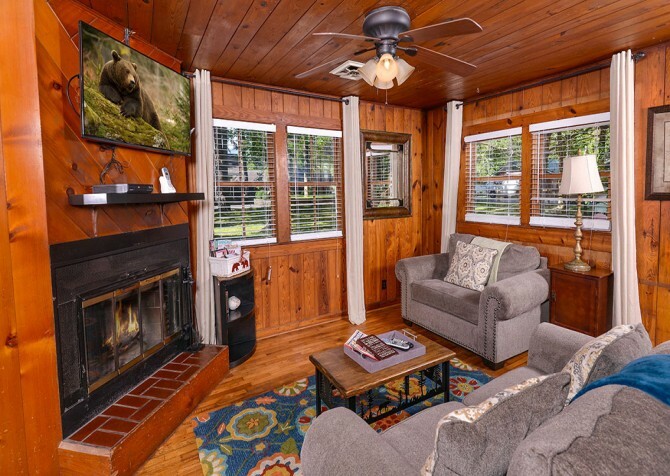 It features bedside tables and lamps, windows for some fresh morning light, and a flatscreen TV in the corner – no sharing remotes! 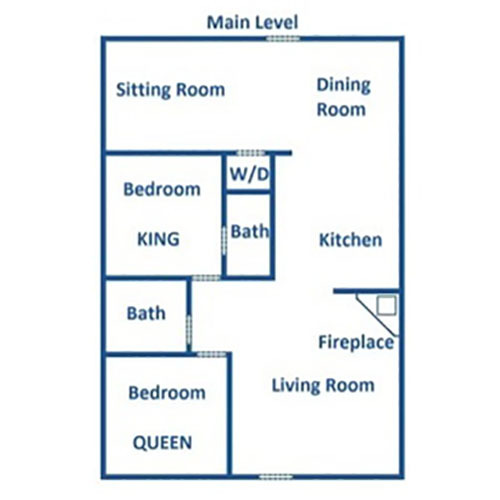 A second bathroom in the hall gives more space for getting ready as well. 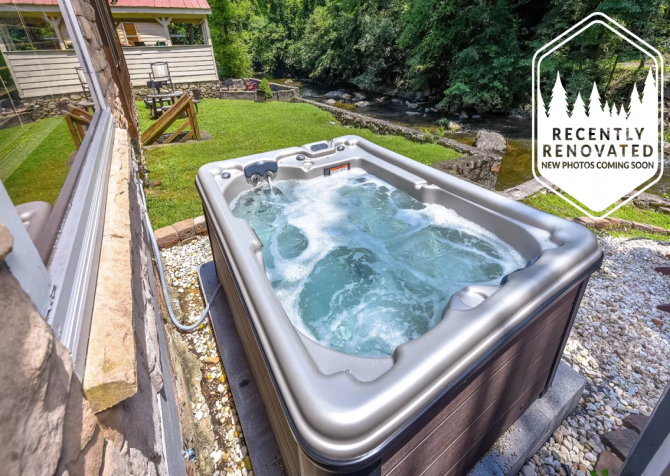 After all the adrenaline-pumping fun while ziplining and hiking through Foxfire Mountain, toss dirty clothes in the washer beyond the kitchen, and climb into the bubbling warm waters of the jetted tub of the master suite’s bathroom. 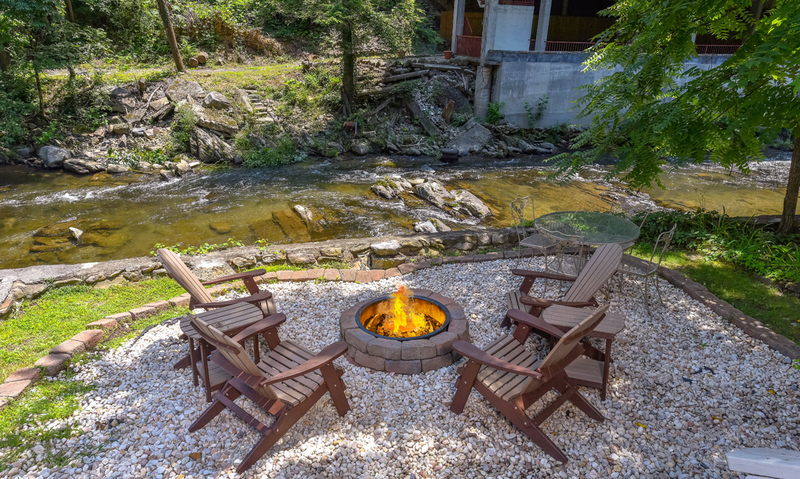 Bring your fishing poles, bag of charcoal, and food to grill for an amazing day spent outside only steps from your Gatlinburg cabin’s back door! 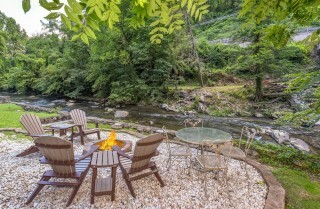 Under the warm Tennessee sun and in the crisp air of the mountains, kick back in the lawn chairs right on the river. Take sips out of your cold beer in between flipping burgers and sharing stories around the fire pit. Bring out some plates and set up the perfect picnic lunch under the afternoon sun while being serenaded by birds and the babbling of the river. 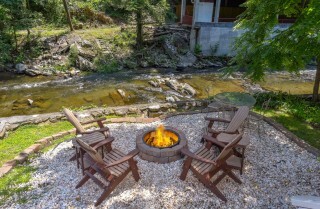 In the golden light of dusk, get the fire started while the kids laugh and throw rocks into the river. Once the flames are stoked and s’mores supplies are on the patio table, let the kids grab a marshmallow to skewer and roast over the fire. 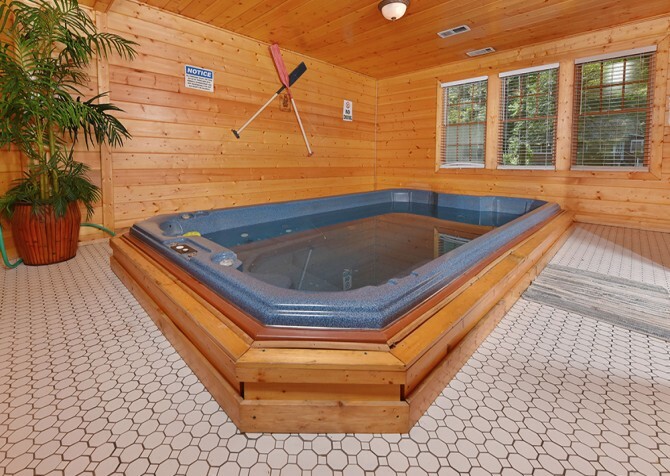 Then climb into your new hot tub for a soothing soak before calling it a night. 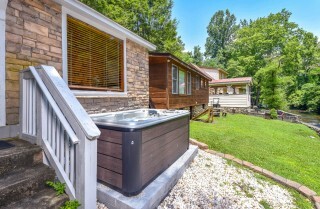 If you’re looking to book several cabins at once, cabins within walking distance of River Romance include On The River, Pooling Around, Simone's Cottage, and Skinny Dipping. 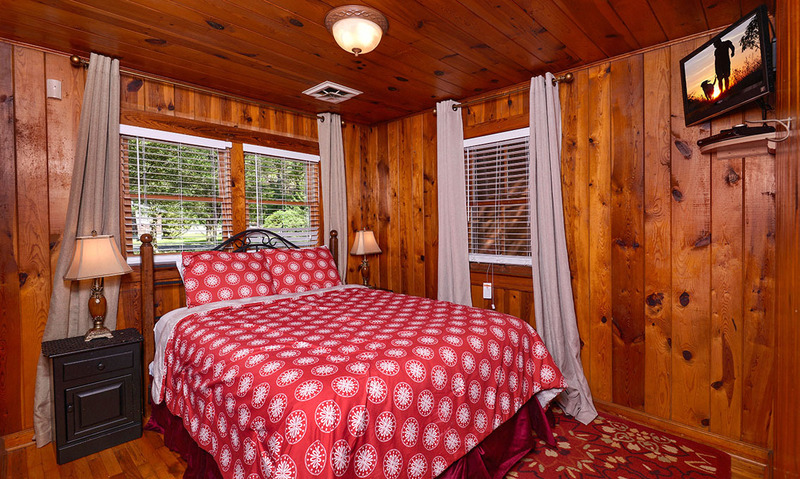 You could book them all for a large family vacation without sacrificing privacy! 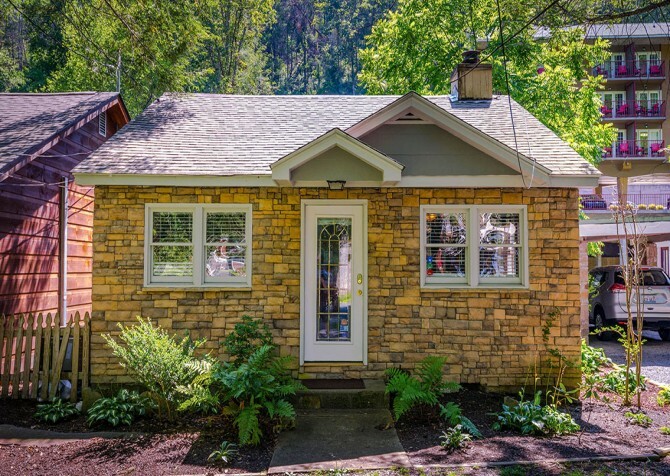 If you have any questions on pricing or availability, give us a call at 1-800-684-7865! 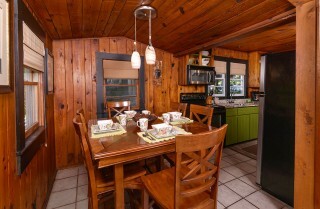 Our vacation planners would love to answer any questions you have. Let us help you plan your dream vacation! 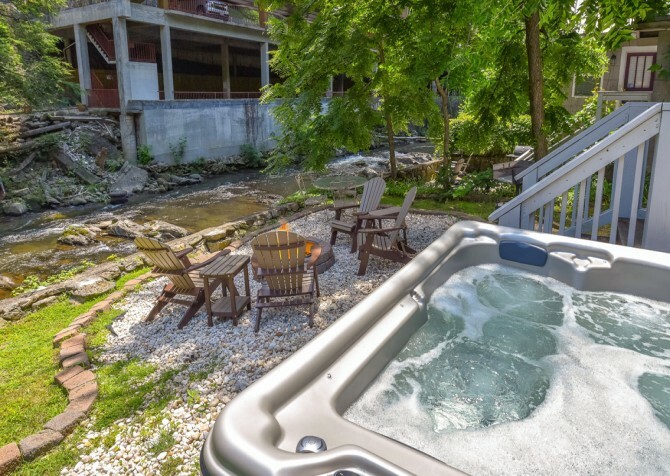 Mini-golf and laser tag, go karts and arcades, moonshine distilleries, live music, outlet shops, dinner shows, old-time photos…there’s something for everyone in downtown Gatlinburg! >Crowned as one of the country’s most unique private theater companies and a historic National Treasure of Gatlinburg, you will definitely want to reserve one of your evenings in the Smokies to be a part of this hilariously unique theater experience! >Gaze over the entire city of Gatlinburg with 360-degree views from over 400 feet above the streets at the top of the Gatlinburg Space Needle! One ticket grants two rides, so visitors can take advantage of beautiful views during the day and the peaceful lights against dark mountains at night. Ride a glass elevator back to the bottom and visit the Iris Theater, Arcadia, and the Slice Pizza Bakery! >From November to February, the Smoky Mountains celebrates the holidays with millions upon millions of lights, parades, and shows across the three cities of Sevierville, Pigeon Forge, and Gatlinburg for the biggest holiday extravaganza in the South! Catch Santa and all his North Pole friends in Dollywood and ride the Pigeon Forge Trolley for the best Christmas lights tour you and the kids will ever experience! "This cabin was so cozy for our Christmas getaway. The location is perfect!" Yay! 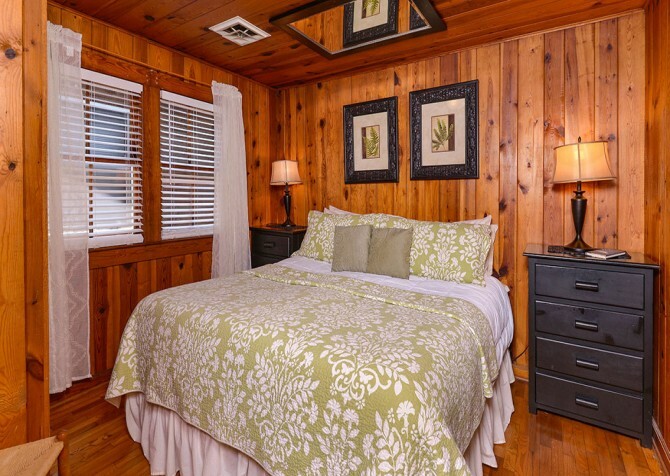 We're so happy to hear you had a very Merry Christmas at River Romance! 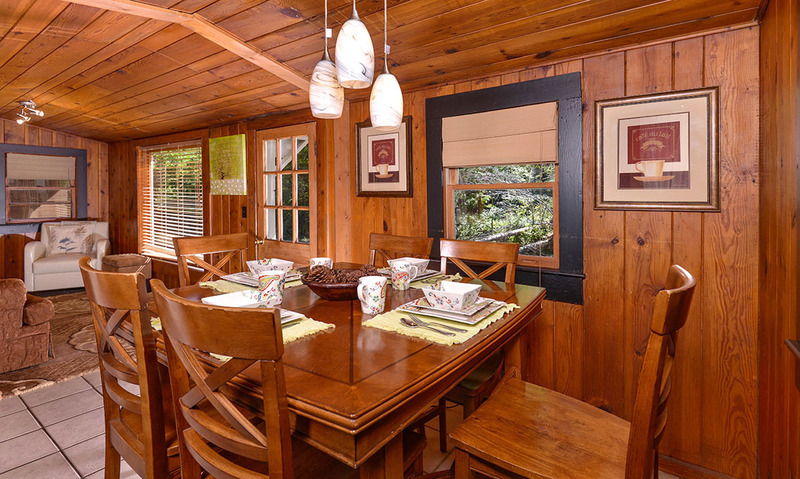 Come back soon — the Smoky Mountains miss YOU! "We stayed in River Romance last week and had a great time visiting Gatlinburg and the national park. 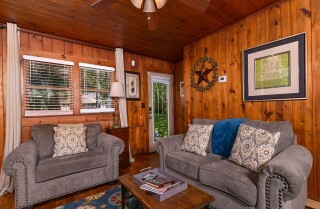 This cabin was super cute and cozy and right on the river. 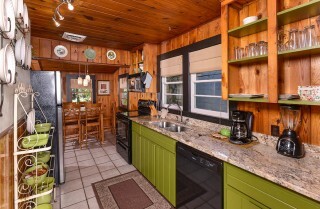 Everything we needed was here including all appliances in the kitchen, wifi, washer and dryer. 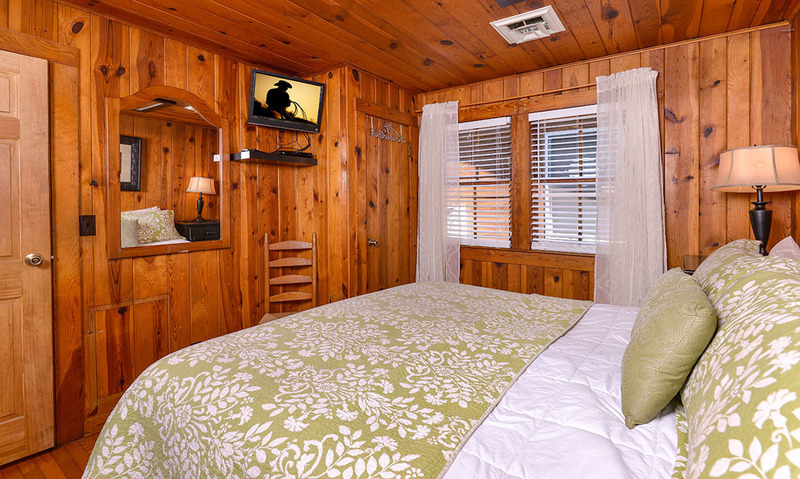 Cabins for You made our stay really easy with lots of regular communications before our arrival. And they were very accommodating when we locked ourselves outside without our door code. I would stay here again."